The property market in Noida has been one such success story over the last two years where there has been visible growth around Greater Noida West and Noida Expressway. Leading this growth story has been sector 150 in Noida. Sector 150 had always been a preferred location for developers as well as residents because of its strategic proximity to places such as the Pari Chowk, Formula 1 Race Track, Night Safari, Gautam Budh University, Yamuna Expressway and the Faridabad-Noida-Ghaziabad expressway. Thankfully, now residents of the Noida- Greater Noida corridor have one more way to connect fast with Delhi and adjoining areas. Thanks to the metro connectivity going live now and trail runs being conducted, Sector 150 with its ready to move in project adjacent to the Noida expressway has truly become a luxurious location. 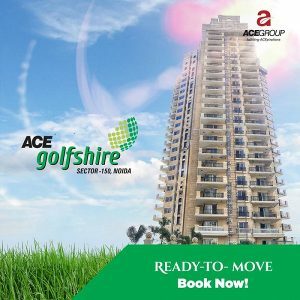 Patrons looking for luxury projects in the Noida Expressway couldn’t be more pleased with the latest luxurious offering of the ACE group – ACE Golfshire, a golf themed residential campus where the serenity and green expanse will bowl one over. ACE has designed this campus with sparse living in mind and thus only 455 flats make up this huge campus with only 2 and 3 BHK dwellings. A club house, skating rink, swimming pool, banquet hall, gymnasium, library and spa are just some of the amenities that you can hope to find here.